This IMPACT Mixer Grinder 550 W Power with Shock Proof Elegant Design Body. It has 3 Speed With Pulse and Overload Protector. 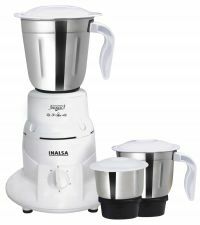 This Mixer Grinder comes with a 2 Stainless Steel Jars. It has Cord Winder for Proper Cord Storage and an 2 year warranty on this Mixer Grinder. To Recieve updates and possible rewards for Inalsa Impact Ex please sign in. To Recieve updates and possible rewards for Juicer Mixer Grinder (JMG) please sign in.